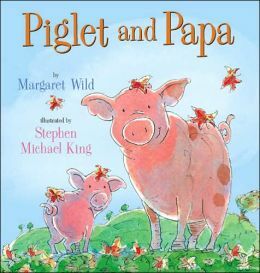 Summary: After a misunderstanding with Papa, Piglet sets out to find someone else in the farmyard who loves her. Literary elements at work in the story: For human beings, whether they be two years old or ninety-two, one of the most critical issues in life might be boiled down to the question, “Does anyone out there love me?” Piglet sets out on an archetypal quest to find someone with the answer to that question. As with any good quest, Piglet learns something from each encounter with a farm animal, and each encounter leads her closer to the answer, which it turns out, she finally finds at home where she started. How does the perspective on gender/race/culture/economics/ability make a difference to the story? Families in this barnyard come in all shapes, colors, and sizes. Parents are uniformly loving, and devoted papas are as plentiful as mamas. Theological Conversation Partners: No matter what sins we commit, we can return to God and be welcomed back (see, for example, the story of the Prodigal Son in Luke 15:11-32). Piglet’s sharp bite on her papa’s tail hardly qualifies as the profligate life, but the assurance of pardon is still quite clear. A second connection in this short story has to do with the power of community. We are surrounded in Christian community by people who love us for who we are. The animals on this farm appear to have taken their baptismal vows seriously. Each one assures Piglet that she is worthy of love, and each one points her toward the real source of all love, which is orders of magnitude greater than their own. Why do you think that Papa did not answer when Piglet asked, “Do you love me?” at the beginning of the story? If your mom or dad were angry, to which other grownup might you go for reassurance? Have you ever made a mistake and hurt your mom or dad? What happened? How did you know that you were forgiven? Why do you think that God loves you? This review is written by Union Presbyteran Seminary graduate and regular contributor Beth Lyon-Suhring. Piglet and Papa by Storypath is licensed under a Creative Commons Attribution-NonCommercial 4.0 International License.